China has suspended approval for new nuclear power stations following the accident at Japan's Fukushima Daiichi plant. It will also carry out checks at existing reactors and those under construction. China is currently building 27 new reactors - about 40% of the total number being built around the world. The news comes as China grows increasingly worried about the nuclear accident in Japan. 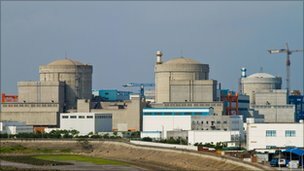 The decision to temporarily halt approval for nuclear plants came at a meeting of China's State Council, or Cabinet, chaired by Premier Wen Jiabao. "We will temporarily suspend approval for nuclear power projects, including those that have already begun preliminary work, before nuclear safety regulations are approved," read a statement from the State Council. "Safety is our top priority in developing nuclear power plants." It went on to say that China's medium and long-term nuclear plans would be "adjusted and improved". Will Japan crisis curb rise of nuclear power? China currently gets only about 2% of its electricity from nuclear power from 13 reactors, but it has launched an ambitious project to drastically increase those figures. It is currently building more reactors than any other country in the world. According to the World Nuclear Association, China wants to build a total of 110 nuclear reactors over the next few years. This is part of a plan to develop other energy sources - such as wind and solar power - to reduce the country's dependence on coal, which currently supplies about three-quarters of its energy needs. China also recently announced that it had developed its own technology to reprocess spent nuclear fuel, which could be used to run these new power plants. Yang Fuqiang, an energy and climate change expert, said the government's latest move showed it was being responsible. "There are many nuclear power stations under construction at the moment - that's risky. We have to go back and check each one," he said. "If there is an accident it will be worse than in Japan because many of the new plants are near high-population areas so we need to be careful." China's State Council has assured people that the country will not be affected by the radioactive leaks. But shoppers have been buying up vast quantities of salt in many parts of the country, partly in the belief that it could protect them against radiation. Potassium iodide, a salt, protects the thyroid gland against radioactive iodine. Some people also seem to believe future supplies of salt could be contaminated by radiation leaking from the Daiichi nuclear plant, so they are buying up stocks now. "We need to dispel rumours. Don't let Japan's nuclear crisis become China's salt crisis," said on online commentator. Pharmacies are also reporting massive demand for medicine that protects against radiation.